When women who fake pregnancy end up in the news, it’s usually not a feel-good story. Telling a lie that has spun out of control, these women – few and far between, thank G-d – try to obtain a baby through any means necessary, with tragic and sometimes fatal results. 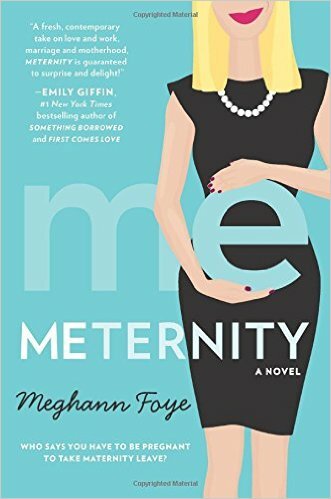 Magazine editor Liz Buckley, heroine of Meghann Foye’s new novel Meternity, must be unaware of these disastrous outcomes. But she’s all too aware of the preferential treatment given to her mommy colleagues at Paddy Cakes magazine. It starts with the baby showers, goes through maternity leave, and ends up with the moms constantly leaving work early for doctor’s appointments, mommy and me classes, and other child-centered activities. And Liz is the one holding the bag, having to rewrite stories, track down interviews, and stay late to cover for them. Even worse, as a childless woman at a baby magazine, her opinions don’t matter. “Spoken like a woman without kids” is a refrain she hears often. When Liz, who dreams of being a freelance travel writer rather than covering the latest front on the baby-wearing wars, is told to give up a business trip to Paris to cover for an editor who has a family reunion in the Caribbean, it’s the last straw. Her stress-induced nausea is mistaken for morning sickness, and Liz runs with it. She tells her colleagues that she’s pregnant. Immediately, the attention, the accolades, and the questions are all hers. And Liz has every intention of going through with it. At the end of the nine months, she’s going on a “ME-ternity leave,” where she’ll travel, relax, and gear up for a new job. But without a man in her life – and that bump in her belly undeniably fake – how long will Liz be able to pull off this subterfuge? And when she’s caught, will she lose everything? As a mom who struggled to balance child-care issues with full-time employment when my son was a baby, I found Foye’s premise a little outlandish. Studies have shown that moms who work are penalized for leaving early due to family issues (while the dads in the office are applauded for actually taking care of their own children.) even when they cover all their work responsibilities. And yet Foye is absolutely right that childless workers of both sexes feel slighted by leave policies. They feel that if Jennifer takes off a few hours early to meet with her son’s teacher, they should also be able to leave early for kick ball in the park and happy hour. I have strong memories of arriving at my office at eight am, watching my childless female colleagues roll in around ten, and then seeing them roll their eyes when I left at five. Fortunately, as Liz’s fake baby bump grows, so does her empathy for the real mothers in the office – especially her self-described nemesis, Alix. As Liz becomes truly attached to her fake baby, these women drop their Facebook-perfect facades of motherhood and clue her into the real stresses. Liz also becomes more likeable – not just because she stops judging the mothers in the office, but because she becomes more diligent about her job. In the opening chapter, she blames Alix for rewriting her copy and demanding last-minute changes, but Liz’s own responses reveal that she hasn’t been keeping her boss in the loop or making changes as soon as they were requested. “I was going to do that when I got back from vacation” is never an answer that a manager wants to hear. I was expecting Liz to take the easy way out with the traditional soapy fake miscarriage. But Liz falls in love with her fake baby, whom she names Lucie Rose, as well as the benefits of fake impending motherhood. As Liz feels more and more guilty and conflicted, the stakes get higher as her bump gets bigger. I found myself wanting Liz to get away with it, while the same time hoping for a spectacular reveal that forces Liz to eat her baby bump. Kudos to Foye for inducing such conflicting emotions in the reader. In a way, Meternity reminded me of my favorite Chick Lit Central book review from 2015, Lisa Doyle’s Milked. Both novels masquerade as light-hearted comedies about contemporary motherhood and maternity, while really shining light on pressing problems faced by today’s mothers. In Milked, Doyle explores how the gig economy and the ever-growing gap between the one percent and the ninety-nine percent makes parenthood almost unaffordable for middle-class, college-educated single women living in a major city. Meternity sheds light on the war between parents and non-parents in the workplace, a war exacerbated by meager maternity benefits, unaffordable child care and unrealistic expectations for both mothers and workers. “Chick lit” is sometimes disparaged as a superficial genre focused on shoes and boyfriends. Books like Milked and Meternity prove that pretty heroines, funny situations and clever dialogue can be found in novels that explore real issues and serious dilemmas. Thanks to BookSparks for the book in exchange for an honest review. It's part of their "It's Raining Books" tour. Great review. I enjoyed this book! This sounds interesting! I'm going to read it at some point :) thanks. Book Review: Who’s That Girl?